MODERN ADDRESS 7480 Lamar Ave.
1852: District established and school built for $250. 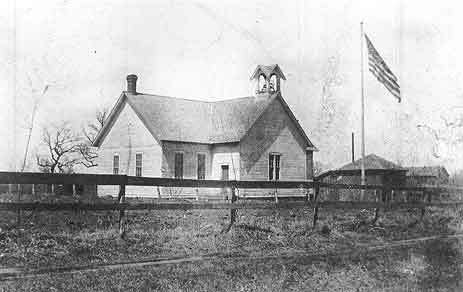 1868: New school built with two classrooms for a cost of $3,600. 1950s: School is torn down, and a house is built on the location. The first school was in an old log cabin built by J.S. Norris, and consisted of 8 pupils. Very famous for its Tom Thumb wedding (a mock wedding put on by the schoolchildren) in 1931. Other teachers (before 1898): Emma Winkley, Nellie Winkley, Walter Ayres, Miss Tuttle Jennie Witherspoon, Bee Malone, Grace Derome, H.W. Briggs, Dr. Bacon, J.W. Howard, and Emily Crippen. 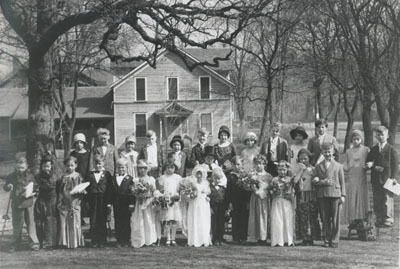 Cottage Grove School students performing the “Tom Thumb” wedding in 1931.